As winter slowly glides in the deep desire to sip a warm cup of hot chocolate is simply beyond you can justify. But a typical Hot chocolate cup could get quite boring at times and that is when you might need some booze for a twist. 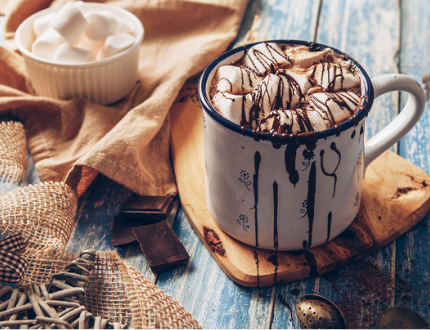 These simple yet amazing Hot chocolate recipes could be the right choice of drink for a warm and fuzzy winter evening. 1.Cocoa Buie: A lovely cocoa mix can never be anything less than amazing but with some simple Drambuie it could get closer to perfection. In a saucepan add the milk and heat it. When slightly warm add the cocoa mix and keep mixing to ensure there are no lumps. Add some ground cinnamon along with the kosher salt. Stir slowly and add Drambuie and let it mix together. Serve a delicious cup of the drink with some marshmallows to enjoy thoroughly. 2.Viennese Velvet Hot Chocolate: Some thick creamy topping over a luscious drink such as this is the perfect comfort drink for chilly nights. And you can grab most of the ingredients simply off your kitchen shelves. 1.In a saucepan add the milk and turn the heat to medium. Add the chocolate and let it melt and mix together completely. Add some Black Velvet Whiskey and mix them. Keep stirring while you slowly add the egg yolk and whisk to add a soft texture to the drink. You can add some sugar if you would like to enhance the flavor. Top the drink with a spoon of thick cream and serve. 3.Kahlua Hot Chocolate: Oozing with the rich texture of marshmallows and the contrasting flavors of salted caramel this is a soothing drink for a cozy evening. In a pan add the milk, cocoa powder and mix them. Add the drink to glass and garnish with marshmallow, chocolate syrup, and salted caramel and finish this delicious drink. 4.Red Wine Hot Chocolate: A sparkling glass of Tesco prosecco can make any evening lovely. But a generous pour of wine can make even a cup of hot chocolate simply the best drink you could ever imagine. If you are using an extremely dry wine then add some sugar to balance the drink. Stir the mixture in simmer and wait for the chocolate chips to melt completely. Remove from heat and add to glass. Garnish with vanilla extract and orange peel and serve to entice. 5.Boozy El Submarino: This fun drink from Argentina is the perfect balance of boozy you will want in your hot chocolate. Add the milk and chocolate to a saucepan and let them blend together completely. Add sugar and vanilla extract and let the mixture blend well. Add the scotch and finish the drink. 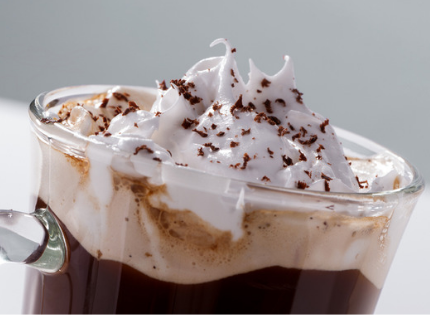 You can also add some cream to the cup before you serve and garnish with some chocolate shavings. 6.Tequila Mint Chocolate: If you would like some boozy hot chocolate but skip the usual pairings then try some tequila mint chocolate that will change the traditional hot chocolate vibe with its refreshing taste. Add all the ingredients except the mint leaves to a pan and let them blend together while heating in simmer. 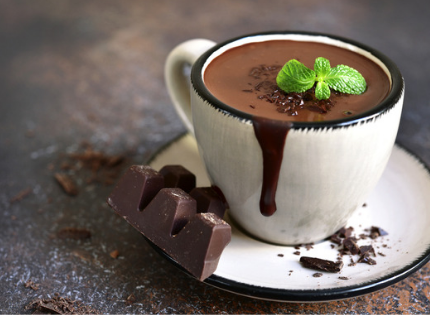 Remove from heat and garnish with some mint leaves to enjoy a fun and refreshing hot chocolate recipe. 7.Raspberry Hot chocolate: You can feed your winter fruit craving with this outstanding fruity hot chocolate recipe that is the perfect balance of chocolate and fruits. In a pan reduce Chambord to 1/3 the initial quantity and bring it to boil. In another pan add the milk, cocoa powder, heavy cream, and chocolate chips and heat and mix together. In a cup pour the hot chocolate and add Chambord to your liking and garnish with cream and raspberries and that is every sip of a heavenly drink. Let these drinks bring warmth to the chilly winter evenings in every cup. 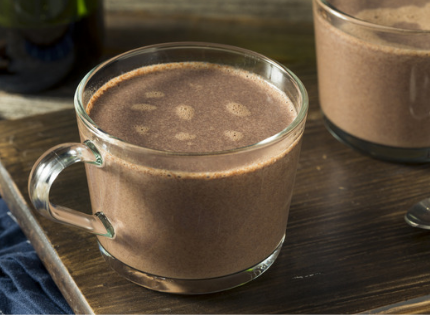 You can also try to give a healthy twist to these hot chocolate drinks by ditching the liqueur and adding optimum nutrition whey powder that will make a healthy post-workout drink.